St. Kitts and Nevis are two island country in the Lesser Antilles, with a location of 17 20 N, 62 45 W. The islands have a total area of 261 sq km. Basseterre is the capital, and English is the official language. St. Kitts and Nevis has a total population of 49,898 with an average life-expectancy of 74.37 years.The country is black ,5% mulatto , 3% Indo-Pakistani, British, Portuguese, and 1% Lebanese, 0.6% other. 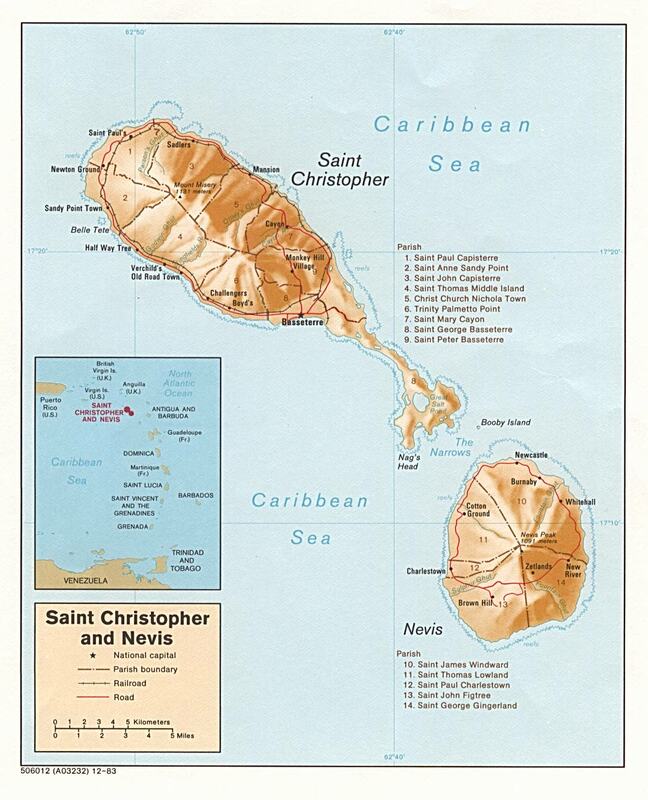 St. Kitts and Nevis is 75% Protestant (of which 24% Anglican, 23% Methodist), 11% Roman Catholic, 14% other. The country has a literacy rate of 97.8%. Cost of Inaction by 2025 16 bil. St. Kitts and Nevis is experiencing periods of great droughts. In 2015, annual rainfall fell by 55%. This has negatively affected farming and food security. Water rationing has been implemented. Coastal aquifers have been contaminated with saltwater. There have been a reduction in fish production from fishing. Some parts of the country seems to have an inundation of rain leading to hillside erosion. The government is addressing the issue of climate change. They plan to get 100% of their energy source from renewals by 2020. They are talking about becoming the first completely green country in the world. Geothermal energy is being explored as well as solar and wind sources. They are planning to implement actions that protect underground aquifers. In addition, St. Kitts and Nevis is planning actions that will increase the capacity for rainwater harvesting. Water desalination is being added to the arsenal of climate resilence. Tax incentives will be used to encourage water conservation. Caribs were the original inhabitants of St. Kitts and Nevis, and for a while they were able to fight off French and British settlements. In 1623, the British formed the first European settlement and establish sugar production. During the 1600s, we see large importation of enslaved Africans. Between 1828 to 1895, the islands went from producing 8,369 to 13,095 tons of sugar. The island kept changing hands between France and Britain. In 1783, the Peace Treaty of Utrech made it a British colony. Between 1816-1871, the islands were ruled as one with Anguilla and British Virgin Islands. In 1983, St. Kitts and Nevis received independence. In 1639, St. Kitts had its biggest slave revolt in the Capesterre section. Sixty blacks took a defensive position on Mt. Misery, accessible via a narrow pass. It took 500 soldiers to put down the rebellion. Some of the slaves were burnt alive, re-captured , and hanged, cut into pieces and put on display as a warning. The leader evaded capture for three years. He was captured after fending off soldiers with muskets. A lucky shot took him down. During the 1830s, 30 maroons lead by Markus, "King of the Woods" raided plantations, spreading mayhem and terror among plantation owners. Slavery which ended became apprenticeship in St. Kitts. In 1834, blacks walked out on plantations and engaged in island wide work stoppage. News had spread that freedom was granted to Antigua and to some slaves on the island and was being withheld from them. Some fled to the hills and joined Markus's Maroon. It took martial law and a militia from Antigua to put an end to the rebellion. No one was killed or executed.